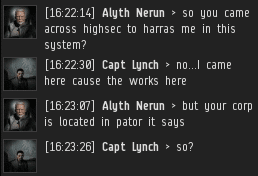 Not much happens in highsec that I don't hear about. Having omnipresent Agents makes keeping track of the hundreds of thousands of highsec residents a lot easier. Is having total knowledge of highsec excessive? Not at all. It's necessary, if we're going to achieve 100% Code-compliance. Which of course we are. 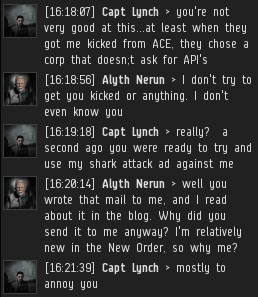 Agent Alyth Nerun reported that he had been randomly contacted by notorious highsec scofflaw Capt Lynch. Alyth hadn't had any previous interaction with Lynch, yet Lynch went out of his way to insult him. If he followed his pattern, this would be the part where Lynch turns around and accuses the New Order of harassing him. 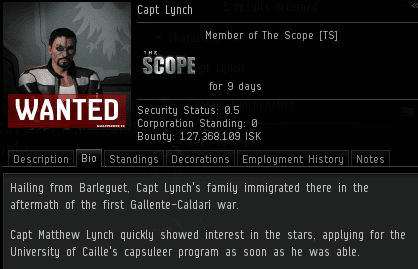 In some ways, Lynch is a microcosm of the highsec community. There are ups and downs. It's a bit like a rollercoaster: One day a happy family of four is fully Code-compliant, and the next day they're violating the Code. Lynch was apparently going through another of his anti-Order phases. 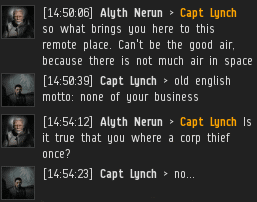 Later, Alyth spotted Lynch in a remote corner of highsec. Lynch followed him! Alyth was still perplexed, so he asked Lynch about his history. Lynch maintained his innocence. It's true that a corp theft committed by a New Order awoxer was once pinned on Lynch, resulting in Lynch's expulsion from the corp. He's been expelled from a lot of corps, though, so it was bound to happen sooner or later anyway. 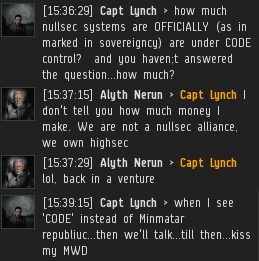 During the course of their conversation, Lynch admitted that he funds his EVE activities solely through the purchase of PLEX, which he buys with real money and sells for isk. Classic RMT. Bizarrely, Lynch still needed to mine ore. 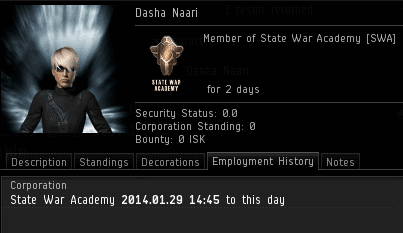 He actually paid real money so he could get isk... and then spent his time mining for more isk. 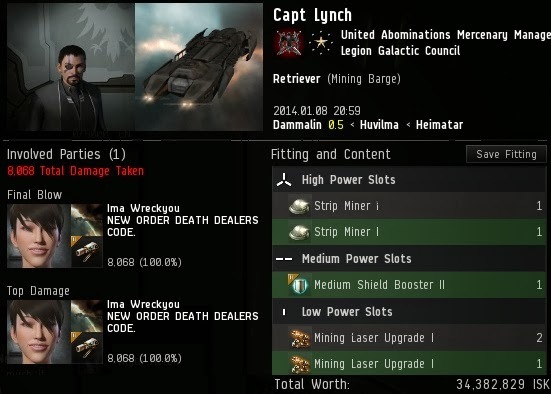 When we first encountered Lynch back in 2012, he gave us the old "I'm not a highsec miner, I'm just mining in highsec" line. What excuse would he have this time? Seeing Alyth's bumping Stabber in the belt, Lynch switched into a Venture so he wouldn't risk bump. 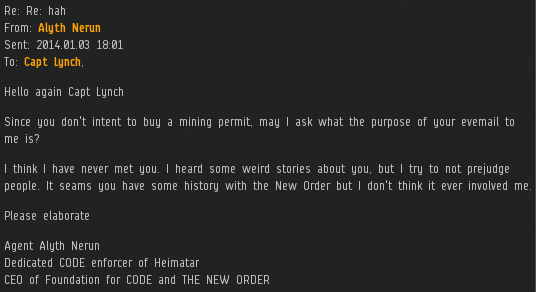 Mining highsec ore in a Venture--a sorry fate for a 2009 character. Still trying to untangle the enigma that is Capt Lynch, Alyth directed his attention to a MinerBumping post from the day before. In the post, Lynch had convo'ed me to tell me about his plans for an anti-miner mercenary corporation. Now he was mining for someone's corporation. Lynch was sensitive to threat of being expelled from his latest corp. But in a rare moment outside of his default "victim" mode, Capt Lynch admitted that he had singled out Alyth for harassment. ...After which he immediately backpedaled and made up a story about the corp being located where Alyth happened to be. Classic Lynch. Playing it safe, Alyth logged onto a ganker alt a few hours later and killed Lynch for the crime of illegal mining. 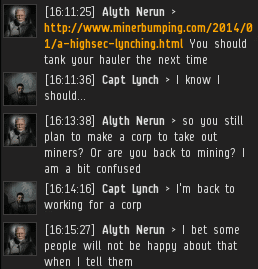 After all this time in the presence of the New Order, Lynch still doesn't know how to tank a mining barge, it seems. Within days, Lynch had been expelled from his corporation. He probably blames the New Order for this. He shouldn't. The New Order rules highsec, but highsec residents still need to exercise personal responsibility. Several days later, I wrote a stirring series of MinerBumping posts about the New Order's path to victory. Lynch responded by using his alt, Dasha Naari, to post a complaint thread about the New Order on EVE-O entitled, "James 315... professional troll?" Then, a few days later, Lynch biomassed the alt and re-registered it. Nobody ever said saving highsec would be easy. I'm curious. If a player buys plex and sells it for isk, and then donates the isk to the new order, is this still RMT? Wait...if buying plex to sell it for isk is illegal and bannable...then CCP needs to ban its own website...where you can buy Plex and stp advertising the Plex sales they run off their website. Real Money Trading refers to, for example, selling a Macharial for $70 or something like that and advertising ingame. Sorry, Mr X, Real Money Trading is an English phrase with a well-established meaning, dating from before EVE even existed-and PLEX is RMT. (ultima online preexisted EVE online and the term was used there). You could be the CEO of CCP, and you still wouldn't get to redefine the English language. Redefining the English language is Shakespeare's job, not the CEO of a gaming company's job--especially not an Icelandic gaming company. Your first claim: "Wait...if buying plex to sell it for isk is illegal and bannable"
No one said it was illegal and bannable. Try to keep up. Although, if you look at the EULA, it doesn't use the term RMT, but it does clearly prohibit anything one would call RMT, using a definition which clearly makes buying PLEX, directly from CCP, bannable, no matter what you do with the PLEX afterwards. Obviously that would never ever actually happen, but that's how the EULA is worded, a moderately amusing situation. "goon tears" Are in short supply right now due to all the goon smug...and have nothing to do with this topic? God, this guy again. This guy. Over a year ago, I was willing to give him the benefit of the doubt, despite Kainotomiu insisting that he was of poor character. After all this time, I finally understand what he meant. The bald-faced lies and hypocrisy are just too much. I wonder if we would all benefit if every New Order Agent simply blocked him. 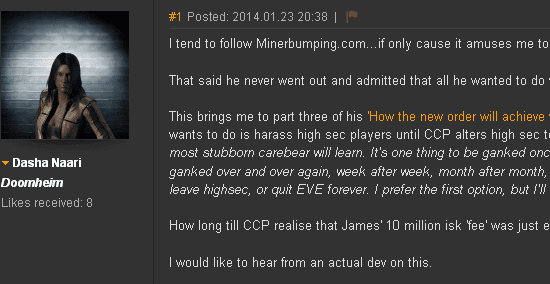 Also... did CCP actually call the police to his house? That is both hilarious and tragic. Not really. Laughing at it is like laughing at someone who's just been run over though I agree with the tragic part. "The last time I posted with my main about stuff like this I was hounded in game and out of game. to the point the police got involved. I would prefer that not to happen again"
"You're insinuating that the police were involved as a result of someone harassing you. They were not. They were involved as a result of your own irresponsibility." How do we know that's even him though? If it was mentioned on the forums, anyone could have found out. It's like a person who gets run over as a result of running across a freeway full of speeding cars - after everyone around him cautions him against it, giving him every compelling reason not to. Sometimes you just laugh at stupid. Still...till I actually see proof that its him who posted those forum posts, I'm giving him the benefit of the doubt...this time. As I said, anyone who reads this blog would know all about him. "Still...till I actually see proof that its him who posted those forum posts, I'm giving him the benefit of the doubt...this time." On another note: perhaps James could leave a list of all the previous posts with Capt Lynch to entertain the newer readers. Your original post indicated you are sick of him and anyone bothered can just go through the blog history. Why give the savior extra work? This assumes Capt Lynch is even telling the truth about being harassed out of game, much less enough to warrant law enforcement involvement, and also assumes a member of NO was involved. AFAIK no NO member has ever been banned for harassment. The police were involved with Lynch, but not because of any "harassment". He made numerous suicide threats in-game and explicitly stated no interest in talking to either his GP or the Samaritans. 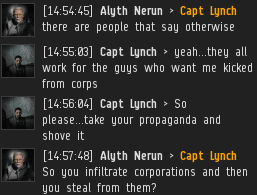 At least one New Order agent, fearing for the RL safety of a fellow gamer, petitioned CCP. It's their policy to pass this sort of information on to local law enforcement. Good guy New Order agent doesn't want you to die in RL. 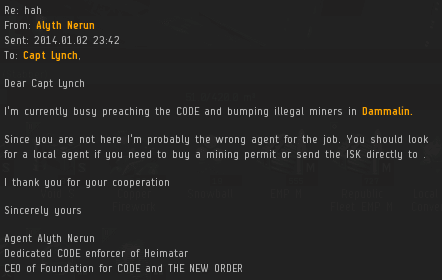 Only wants you to pay 10mil isk for mining permit in a video game.